Love all the shapes and textures on this card Jen! I love how you added the polka dots. Fabulous design Jen! 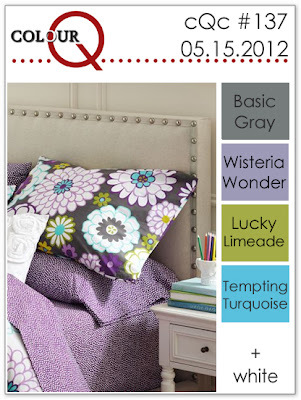 I'm itching to use this color combo...hoping to make it to the craft room before the challenge ends tomorrow!! This card is definitely a winner! I tend to go floral whenever there is a green in a color combo. This is a great take on the color challenge! PS Thanks for playing with us at CAS-ual Fridays! Love that repeat sentiment and those cirlces! Fabulous job with the challenges! So glad you could join in the fun this week at CAS-ual Fridays! LOOOOOOVVVVVEEEEE this SO MUCH!!! It's gorgeous! Thank you so much for playing with us at the colourQ this week! Fabulous design. Love the stamped and cut out sentiment. There circles are perfect. I love the design of your card Jen, the repeat 'hello' is such a good idea and the cut out circle is great. This is great! Love the retro telephone and the repeated hello stamp! Great work. FUN! I especially love the different sized circles! Love this layout, and the hellos are awesome! And the bubbles. Such a cool retro-mod look :) I wish I could find you a way to get our rain...all it seems to grow for us is mosquitoes. I'm guessing we have a week before having to put on repellent every time we go out. I just love this, Jen! Awesome use of those colors and great repetition of the circles and sentiment. So cute! Thanks for joining us at CAS-ual Fridays! Fabulous card, Jen, I love everything you did here! All the stamped and cut hello's are awesome! Thanks for sharing your card with us this week at the ColourQ! this is SO CUTE, Jen!! I love it! The repeated sentiment is so perfect with the colors:) We got a lot of rain here too this weekend, and wow, we haven't even watered our grass yet, but it did need mowing, too! Thanks so much for joining us at ColourQ this week, hope you're having a fabulous weekend. The dotty dots are perfect, LOVE how you have used the colours Jen! I really like the way you've used the grey as a base colour, the brights really stand out against it. Glad your finally getting some wet weather,crunchy grass is not a good look!! Did you cut those hellos?! Your card is so much FUN! Your use of the colors is just outstanding. This is such a fun card. I love how you used the colors, and all those 'hello's. Man, did you fussy cut all those hello's? They are perfect! I love the layout of this card (I'm totally filing that in my mental rolodex for future use). Did you get any bad weather/rain from Alberto? Hope you just got some rain and not anything worse! Jen - this is phenomenal! I love the layout and the way you used the colors. Congrats on your ColourQ win! Congratulations on your ColourQ win. I am in your court this week, and at your service. I'm so late to the party, you already won! And no wonder, it's an awesome card. 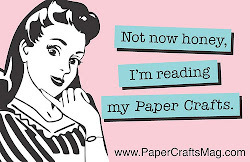 you may have used lots of dies and punches, but you hand-cut all those hellos, didn't you? Wow!